Make your wish for the ideal stroller come true with the Book Pop-Up. Equipped with a premium chassis, folding bassinet and reversible seat, the Book Pop-Up offers the ultimate in style, comfort and mobility. • From birth, to 50 lbs. Take a look at the all-new Book Pop-Up in action. 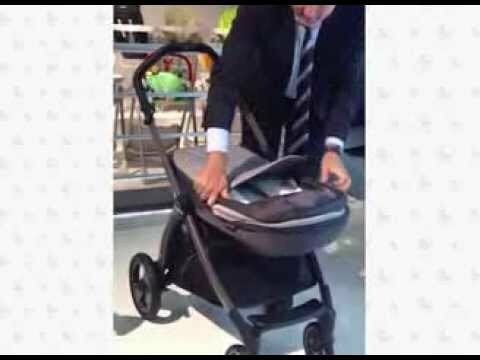 Check out the fold with the seat AND Bassinet Pop-Up! Taken at the ABC Kids Expo in Las Vegas! The Book Pop-Up chassis can accept the Seat Pop-Up, Bassinet Pop-Up or Primo Viaggio infant car seat directly onto its frame. It folds inward, “like a book” with just one hand and is equipped with an adjustable handlebar outfitted with our high-quality “Prima Classe” material. Large polyurethane wheels and ball bearings guarantee a smooth drive, even on the roughest of surfaces. A remote front wheel control allows parents to swivel or straighten wheels without having to bend over and touch front wheels. The Bassinet Pop-Up welcomes your baby with comfort and fashion from the very first days. This innovative bassinet can fold easily with a simple gesture, perfect for carrying and storing. The Bassinet Pop-Up and chassis fold compactly together and stand alone when folded. It includes an externally adjustable headrest and a hood with mesh insert that provides air circulation. Includes a removable mattress and is approved for overnight sleeping. The Seat Pop-Up is a detachable and reversible seat that allows for an easy fold in BOTH rear and forward facing positions. It offers Comfort Recline: The seat and the backrest slide open, creating a comfortable resting angle for the baby. The Seat Pop-Up folds compactly and inward “like a Book” on the Book Pop-Up chassis, keeping the upholstery inside clean and protected. All-new tailoring and upholstery fitting allows for a clean and modern look. Premium Chassis Can fold inward “like a book” with just one hand. Folding Bassinet Bassinet Pop-Up has a unique folding and opening feature; can fold while attached to the chassis..
Reversible The seat Pop-Up can be switched to face parent or the world ahead. 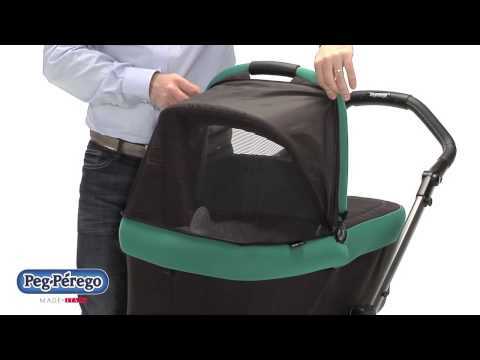 Travel System Travel System-compatible with the Primo Viaggio SIP infant car seat. Accepts car seat directly on to chassis. Easy Close Innovative design allows for quick, easy and compact fold in BOTH rear and forward facing positions. Soft Ride Large polyurethane wheels with ball bearings and suspension allow for 360 degree agility, less effort in pushing and more comfort for baby. Comfort Recline Seat and backrest slide open creating the most comfortable resting angle for baby, unlike in other common seat reclines where the hip angle remains the same. "Prima Classe" Handlebar Adjustable handlebar is outifitted in our “Prima Classe” material; can be modified to fit each parent’s height preferences. Remote Front Swivel Control Allows parents to swivel or straighten wheels without having to bend over and touch front wheels. Large Hood Keep your baby protected with the large hood that includes a UV protected visor and a mesh insert that provides extra ventilation. Stroller - Unfolded 36.5" x 23.16" x 41.58"
Stroller - Folded 15.25" x 33"
Bassinet - Folded 32.5" x 8.75"
Bassinet - Unfolded 32.5" x 16.42" x 26.3"
The Ganciomatic (G-Matic) System allows for the Navetta XL to be attached directly to the stroller chassis, offering a comfortable alternative for the growing baby. Escape from the ordinary with Circles Choco’s soft earthy browns hues.Large scale circle print creates a stylish look that will capture the eye. Soft jersey technosilk and mélange effect fabric blend well in a great combination of function and fashion. Our special Taiana collection is Portraits Grey, an elegant pattern of cross-stitched frames on multi-toned grey fabric. The effect is modern and sophisticated. This rich look, featuring the best of Italian textile tradition and culture, is exclusively made for Peg Perego by Taiana, a historic weaving mill in the Lake Como region. Tulip is a vibrant red offset with a neutral mélange grey fabric that creates a delicate and appealing balance. This contemporary mix is sure to turn lots of heads. Keep baby comfortable on our techno silk jersey material woven from Italian dyed yarns. Part of our Soft Fabric Collection, Tulip has an energetic look. Featuring a graphic print with an arty mood, Circles Blue adds impact to your lifestyle. Classic navy takes an updated fresh look in this luxurious combination of indigo and ink blue. Soft jersey technosilk and printed melange effect fabrics combine well to give a polished look. Step into style with cool grey hues! Dark and light graphite color tones take a new turn in Circles Grey, where the pattern is subtle and impeccable. Soft jersey technosilk provides comfort while printed mélange effect fabric adds a classic look in a modern way. Why Let Baby Have All of the Fun?